As you see in my blog post title, I'm pretty much insecure about editing this month. I don't know if it was from the craziness of April, working to publish Men of Foxwick this month, announcing my debut novel for next year, just catching up on everything in May, or the summer schedule starting at work (means much less sleep), but it has all left me rather anxious when I sit down to edit my own work. This anxiety hit me the hardest when getting ready to do the final edit of Men of Foxwick. I opened up my critique partner's notes and my document. Then, I had an anxiety attack complete with the feelings of apprehension, trouble concentrating, pounding heart, shortness of breath, and twitches. I pushed through and managed to edit the first story in the collection, but it took me a good part of the day to do so. Then, it took me several days to edit the second short story. Another week to edit two stories, and then on Sunday, I finished the last story. That's right. It took me off and on three weeks to do a final edit on five stories (around 27,000 words). 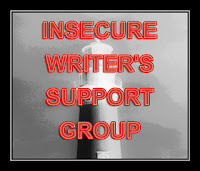 So, yeah, insecurity, I have it this month. And I also apologize for not visiting blogs quite as much the last couple weeks. I've been so busy trying to edit that I haven't had the time to do much else. Everything should calm down next week, though, since I'm almost ready to publish Men of Foxwick. Yes, editing at times can be a bit daunting. Glad you managed to do it. Sounds like you need a vacation. There aren't enough hours in the day to accomplish everything. Be sure to enjoy the little moments. Sounds like you're just out of practice. You finished though! Personally the blank page is scaring me more than editing these days. Sometimes just being too busy can make any task overwhelming. Good luck with the edits. Glad to hear you were able to push through it Cherie! Edits leave me in a state of panic too. Hard for me to overcome them, but once you buckle down and do it, the sense of accomplishment is brilliant. You manage to get through it now you can breathe freely again. Thankfully I like to edit. I just get bored and distracted if I am editing the same thing for YEARS... Which sadly, I am. We all have pitfalls, we just need to KEEP BREATHING and push forward. There's no turning back on this road... so we must PUSH ON! I understand the editing anxiety. I'll be going through it again in a couple of months. But it's great you were able to push through it. It's great that you were able to push through the anxiety and get the edits done, at least you don't need to worry about them now, and you know you can do it next time. Congrats on pushing through and getting it finished. Even thinking about an anxiety attack give me anxiety. But, well done on going on! Yay, on finishing. WTG on pushing through to the end! Someone once told me, "There are writers and there are editors. It's hard to do both." That doesn't mean we can't, but it sure does mean we better know which hat we're wearing when we do one or the other. Can't wait to read your stories! I've been feeling panicked lately, too. As I devote more time to writing, I feel like everything else is spinning out of control. Well, I always get those symptoms whenever I edit according critique notes. You're lucky you don't always have that problem! I just push through it and the story comes out better, provided I can fix it to my satisfaction. The fact that you pushed through when it was difficult says so much about who you are and how passionate you are about what you do. That's when it counts most:-) Good luck with your next publishing!! I love the editing process, but I do always feel anxious about final edits. Nothing ever seems good enough and I always second guess myself. But I know that I have to let go and just publish, otherwise my stories will wallow on my computer until I die. :) It's hard though. You are not alone! The reason you are the best editor I've ever worked with is because you are a perfectionist. I don't know how many compliments I've received on the editing in Oculus, but it's been quite a few. People remarking how clean it was compared to the first one. That's all you, Cherie. Don't be insecure. You see everything. We all get insecure like that sometimes. Also, don't beat yourself up too much when it comes to editing. Three weeks doesn't sound long to me at all, and is even reasonable for 27K words! I can definitely relate to the distractions taking me away from much-needed editing. Hang in there!